Whenever I come home to visit, I always have to laugh at the blatant political leanings up and down Interstate 25. When you go across the Colorado border, you're on John F. Kennedy Memorial Highway. However it becomes quickly evident that you are soon in the conservative bastion of the state, once you leave the Democratic-friendly Pueblo County, and enter into El Paso County, and Colorado Springs, where the road instantly becomes Ronald Reagan Highway. Once you are out of El Paso County? It reverts back to John F. Kennedy Memorial Highway. 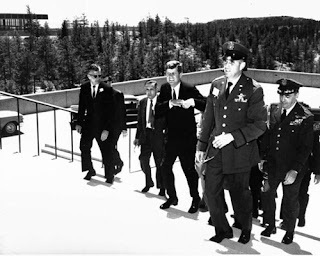 That's why I thought it was humorous to find out that, way back when, the U.S. Air Force Academy asked President John F. Kennedy to be its first presidential commencement speaker, on June 5, 1963 (the previous year, Vice President Lyndon Johnson gave the commencement speech). Politics aside, the President arriving in Colorado Springs was a huge deal. He spoke at 9:45 a.m. in a packed Falcon Stadium and was awarded an honorary bachelor of science degree. Afterward, he went on to visit NORAD, before flying to the White Sands Missile Range, in New Mexico. 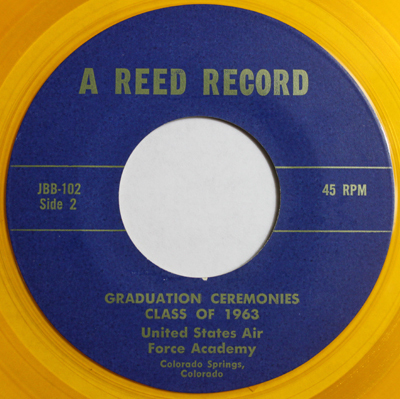 To commemorate the Colorado visit, the Air Force Academy released a vinyl single souvenir - on standard black vinyl (and blue label), and on yellow vinyl (with a blue label). The label notes "A Reed Record," but the flip indicates it was from "J.B.B. Enterprises," out of Hollywood. My copy didn't come with a picture sleeve. Would be cool to know if it came with one.